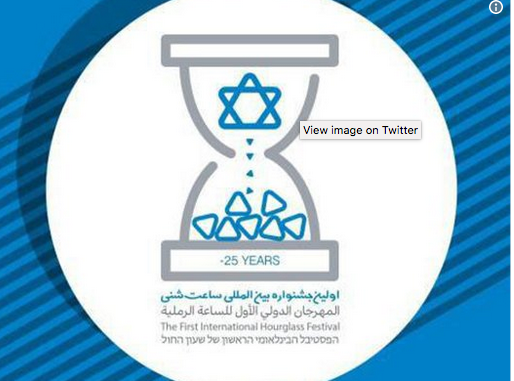 The festival, dedicated to anti-Israel art and media productions, is a symbol of the country’s upcoming destruction, said Hossein Amir-Abdollahian, Iran’s former Deputy Foreign Minister and current assistant to parliament speaker Ali Larijani, at a press conference launching the event. In 2015, Iran’s Supreme Leader Ayatollah Ali Khamenei predicted that by 2040 there will no longer be a State of Israel. At a Quds Day rally in Tehran in 2017, the regime unveiled a clock counting down the days until the Jewish state’s predicted doom. 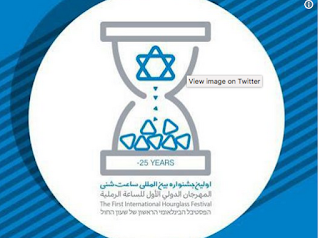 Poster for Iran’s ‘Hourglass Festival’ to celebrate Israel’s imminent destruction. Amir-Abdollahian said he could not publicly reveal the regime’s plans to ensure the destruction of Israel. “The Islamic Republic won’t allow the Zionists to play with the security of the sensitive region of Middle East,” he said. “Iran and its allies in the region, who defeated terrorists, will never allow the Zionists to endanger the region’s security,” the Mehr News Agency reported. It is scandalous that supposedly democratic universalist Western countries habitually overlook Iranian threats of genocide against Israel. Obama and other Western leaders, like Merkel, made a bad deal with Iran that only enables it produce a nuke weapon. Perhaps they are hoping that Iranians will add to the technology.